Nine times out of ten you WILL have something in your wardrobe that would be perfect, but for some reason we usually feel that an invitation to a wedding comes with a free pass to go out and buy something new. I’m not saying that there is anything wrong with that, (ahem, I am a fashion blogger after all!) because I know just how lovely it feels to wear something new, but I think if you are going to purchase, try to make sure that it is something you know you will wear again. Occasion dresses can gather dust after the event has passed, so it’s always a good idea to ask yourself if the dress, jumpsuit or coat you are considering is a piece that you could dress down. Try not to fall into the ‘one hit wonder’ trap. I think the perfect winter wedding outfit should always include a beautiful coat. It gives your outfit the smart factor, adds elegance AND keeps you warm. I really feel the cold and simply cannot endure cold legs and feet for hours, so when it comes to winter weddings I would always try and have my legs covered. Jumpsuits and tailored trousers would be the obvious choice but I struggle to find flattering tailored trousers so I tend to stick with dresses. However wearing dresses in winter leads to another fashion conundrum. Tights…my arch nemisis. When I even think about having to wear tights, memories of my school days come flooding back. Days spent itching, yanking, laddering and generally loathing my school tights. I seem to have passed this loathing onto my girls, as neither of them will wear tights and would both rather freeze in their socks and school skirts in the winter and who am I to argue?! So having narrowed my options down to a dress, black opaque tights and a smart coat, black shoes, a black dress (that I would wear again) and a bright coat seemed like the natural outfit choice. I always feel safe in black and I think the goal of a wedding guest is to look sleek and appropriate. For me, black ticks those boxes and you can easily add splashes of colour with your accessories and/or your coat. 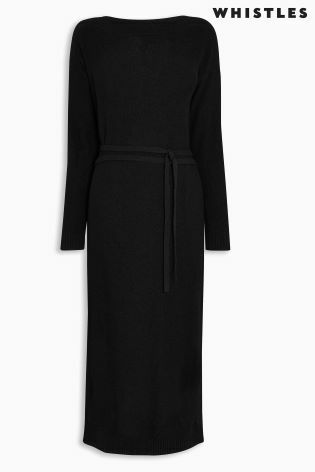 The knitted dress I chose is from Karen Millen and has long sleeves with split arms and pearl details. I love a classic chain strap bag , this one is also from Karen Millen. The shoes I am wearing are from LK Bennett and the coat is from Boden. The dress itself doesn’t scream ‘wedding’ but I think it works with the coat and I know they are both items that I would wear again. I have had a look for some other dress options and have tried to focus on covered arms and wearability. 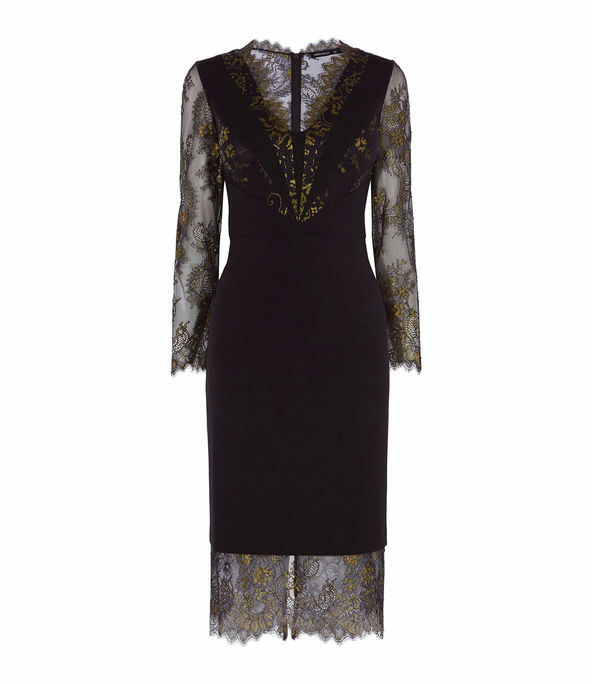 A black lace dress is something that you will wear for years. Dinner parties, date nights, it will work for most events. I thought this one was beautiful and a good price. This is the kind of dress that you could dress down in the winter. I would pair with a smart black coat and black boots for a winter wedding. 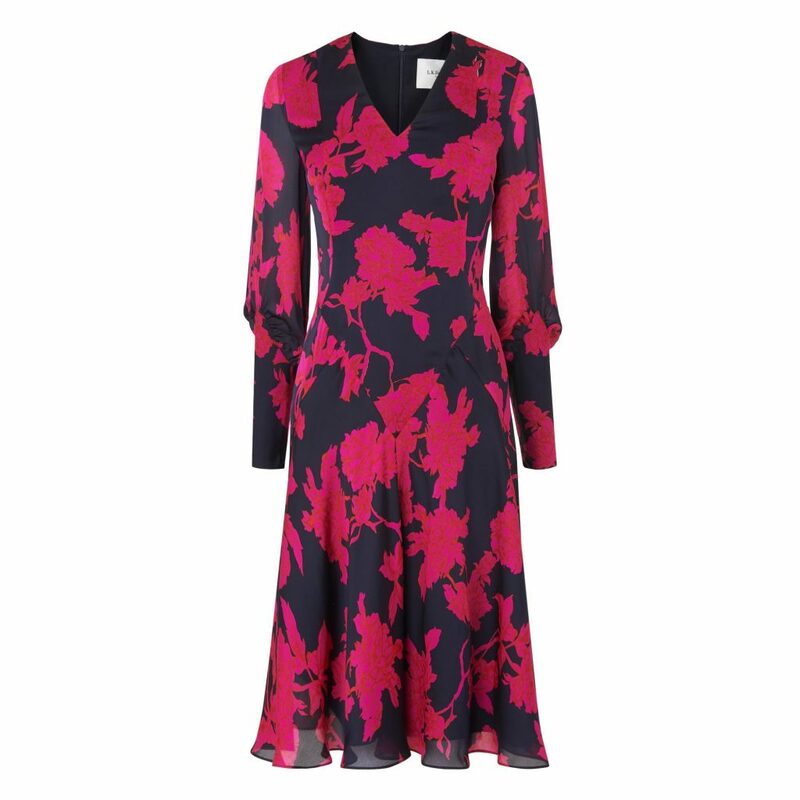 This is such a classic dress, that would double up as officewear and could also be dressed down. I love the belted waist. Okay, this is probably what I would class as an ‘occasion dress’ but it’s so beautiful that I think you would want to wear it again and again AND it’s massively reduced so I had to include it. 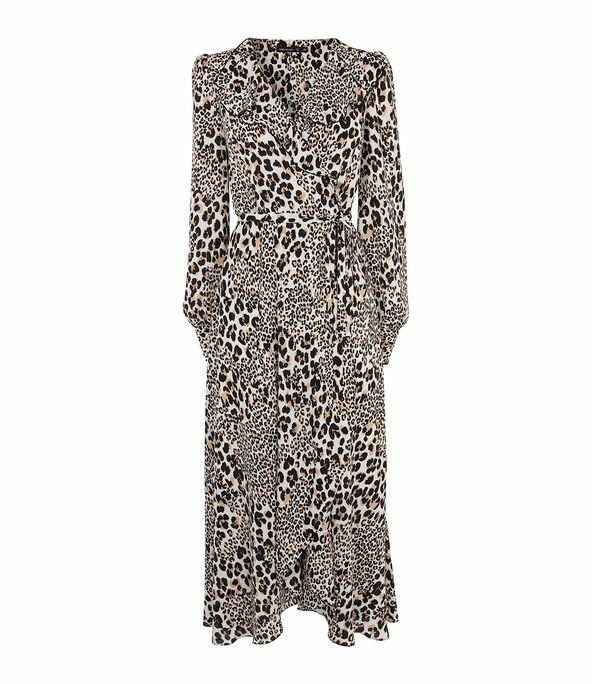 A slightly more affordable option, this is dress ticks all my boxes. 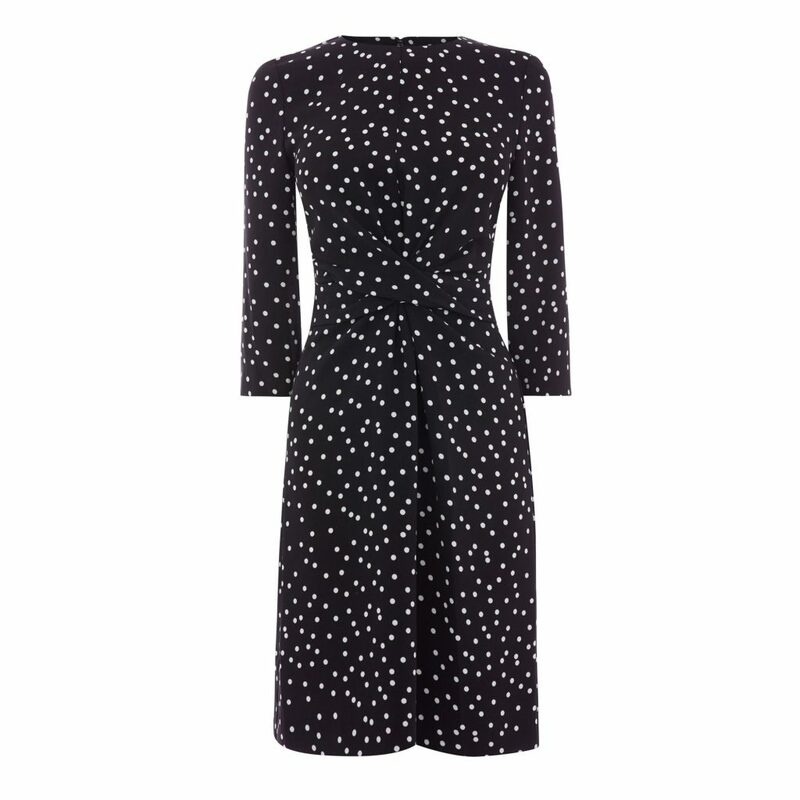 Long sleeves, lovely polka dot print and a good length with a tummy concealing twist. Here are a few ideas for coats with a few sale bargains in there. The Boden coat I am wearing is a size 8 but as you can see from the above photo, it’s a little long in the arms for me. I think a size 6 would have been better so I would say it runs true to size. Another option would be to opt for a statement skirt or a jumpsuit, so I have included a few in this selection. For anyone that has a winter wedding coming up (lucky you!) I hope this has been useful. Remember to shop your wardrobe first and see if there is anything that you could revive by buying a single piece for the ‘something new’ instead of an entire outfit. I too find Bodens regular sizing too long in the sleeves, their petite fit is perfectly proportioned though, wish they would offer more petite size clothes! I think this outfit works really well, the pink coat is great for outside and in the church, and the dress has enough detailing to make it special enough for a wedding, but wearable at other times too!